Lucknow: Favourites India continued their strong showing in the men's Junior Hockey World Cup as they scored a dominating 5-3 win over England in a Pool D encounter to virtually secure a place in the quarterfinals, in Lucknow on Saturday. 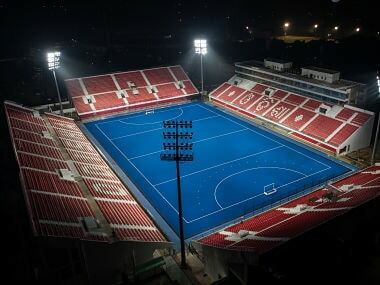 India, who had earlier spanked Canada 4-0 in their tournament-opener, scored two goals in the first half through Parvinder Singh (24th minute) and Armaan Qureshi (35th) before finding the net thrice in the second half, courtesy Harmanpreet Singh (37th), Simranjeet Singh (45th) and Varun Kumar (59th). However, it was England who drew the first blood through Jack Clee (10th) before pumping in two late goals from Will Calnan (63rd) and Edward Horler(67th). The Indians were slow to get of the blocks as England defence hardly gave any space to the home team forwards in the initial few minutes of the match. India had the first shy at the goal in the third minute when Sumit showed fine stick work to dodge a few English defenders and cut inside the opposition circle from the right only to find the side netting with his reverse shot. England who took lead against the run of play in the 10th minute from a counter attack through Clee’s field strike. The goal, which stunned the entire stadium, came as a wake-up call for the Indians who thereafter did not concede an inch to the opponents. Pressing hard in search of the equaliser, India earned their first penalty corner in the 23rd minute. Varun Kumar’s try from the set piece was saved by the English defence but from the resultant attack Parvinder drew level from a move that was set up by skipper Harjeet Singh. Thereafter, it was India all over as they secured back-to-back penalty corners but failed to utilise. Armaan made the scoreline 2-1 in favour of India just at the stroke of half time. Unmarked inside the circle, he just had to dab the ball inside the goal after being set up by Harjeet’s cross from the left flank which got slight deflection from the stick of Parvinder. 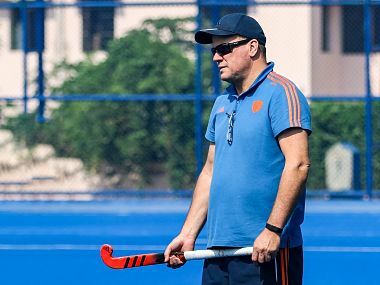 In the final seconds of the first half, England managed to earn their first penalty corner of the match, but they fumbled as India went into half time leading 2-1. India continued in the same vein after the change of ends and earned their fourth penalty corner with the opening move of the second half and Harmanpreet rose to the occasion to extend the home team’s lead. Next it was Simranjeet’s turn to register his name in the scoresheet. The move was initiated by Harjeet who intercepted the ball in the mid-half and then passed it on to Gujrant who set it up for Simranjeet to push the ball in an open goal. Dragflicker Varun then made the scoreline 5-1 favour by converting India’s fifth penalty corner. Towards the end England went full throttle and were also rewarded with two goals -- first through Calnan’s field strike and then through a penalty corner conversion by Horler. But that was all England could manage as India thereafter managed to hold on to their two goal cushion to pocket full three points from their encounter. India are now leading Pool D with six points from two wins and next play South Africa on 12 December. England are placed second with three points from two games and will finish off the pool engagements against lowly Canada on 13 December.